Nowadays distortion and the electric guitar are nearly synonymous. From ripping solos to rocking power chord progressions, guitar distortion has impacted the landscape of popular music since its very inception. Today, nearly everybody who plays the electric guitar uses some form of overdrive or distortion (even some jazz players these days). The funny thing though? It wasn’t always that way. Here’s a neat trick: turn your guitar amplifier’s volume up to 10 (or 11) on a clean channel. Strike a chord (you might want to wear some earplugs for this). Hear that warm, overdriven tone? That’s how guitarists first discovered distortion. When electric guitars first arrived on the music scene in the 1930s they were originally designed for jazz guitarists who were looking to lay down single-note guitar solos in big band ensembles. As the electric guitar caught on, many blues guitarists sought to mimic with their guitars the same raw sounds that singers like Muddy Waters and Howlin’ Wolf made with their voices. Guitarists like Willie Johnson and Willie Kizart put their guitars in “overdrive” by cranking up the volume on their amplifiers beyond the designed limit in order to create a distortion effect. 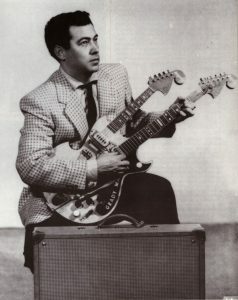 However, guitar distortion as we know it today was discovered by complete accident in 1961 when guitarist Grady Martin used a faulty preamplifier on the Marty Robbins song “Don’t Worry” (that’s our take on the true popular beginning, though songs like “Rocket 88” and artists like Johnny Burnette and Link Wray can lay a claim as well). The faulty pre-amp created a muddy, distorted tone that he liked so much he released an instrumental song later that year with the same faulty preamp entitled “The Fuzz.” People loved it, and other guitarists began to dig the gritty tone so much that they began breaking their amplifiers on purpose, or stuffing them with newspaper just to distort the tone. Kinks guitarist Dave Davies would even slash his speakers with a razor in order to achieve a more distorted sound. Backed by high demand, the following year Gibson came out with the first commercial “fuzzbox,” the Maestro FZ-1—invented by Nashville engineer Glen Snoddy and marketed by Gibson—which Keith Richards used to achieve his signature tone in The Rolling Stones song “(I Can’t Get No) Satisfaction.” The rest is music history. Guitar distortion became the hottest trend as artists like Keith Richards, Jimi Hendrix and even The Beatles began incorporating guitar distortion effects into their work. How distortion works. Image courtesy of Electronics Tutorials. Simply put, distortion is any modification of the wave form of a signal. There’s a lot of interesting science behind how this can be achieved and manipulated but the first guitarists to experiment with distortion had absolutely no idea what they were doing. As with most great things it was simply a process of trial and error. Since those first days of experimentation though, there has been a lot of progress in the way of producing and manipulating guitar distortion. Beginning with the first commercial fuzzboxes of the early 1960s, companies like Fender, Gibson, Vox and Marshall began creating a variety of pre-amplifiers, amplifiers and pedals to purposefully and uniquely distort the sound of the electric guitar. By the late 1960s and early 1970s distortion had cemented its place in the guitarist’s handbook, birthing the genres of hard rock and heavy metal that would come to dominate in the decades to come. One way to produce guitar distortion is through the amplifier itself. This was the original way that distortion was discovered — by maximizing the volume on a power amplifier and “overdriving” the power valves (or tubes) in the amp. Many guitarists prefer this sound as it is the original and most iconic guitar distortion tone. However, because of the loud volume this makes things difficult for live shows and tiny recording spaces. Because of this there have been many methods used to skirt around this issue while still keeping the distorted tone of an amp cranked all the way up. Another way to produce guitar distortion is through a pre-amplifier which, as the name suggests, is a device used to alter the instrument signal before it passes through the main power amplifier. Most pre-amplifiers are used with the gain turned up high to distort the instrument sound while the main power amplifiers are turned down to make the distorted sound more manageable. It is also interesting to note that since distortion carries with it a lot of overtones when playing guitar chords, the first power chords were born from this play style. 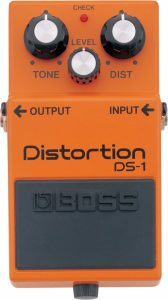 BOSS DS-1, the world’s most iconic distortion pedal. Image courtesy of BOSS. The most popular method used to produce guitar distortion in modern times is the overdrive or distortion pedal. Like pre-amplifiers, these pedals alter the instrument signal before it passes through the main power amplifier. Pedals are essentially perfected versions of the original pre-amps that the guitarists of the 50s and 60s were experimenting with to get that distorted tone. Pedals can be used to add even more distortion to an already overdriven amp or to create a distorted tone played through an already clean channel. With the variety of pedals out there now the possibilities are endless. In terms of mass-market pedals, if you’re looking for a smoother distortion sound much like the guitarists of the late 50s and early 60s go with the Boss Super Overdrive SD-1 or the Ibanez TS9 Tube Screamer to get that warm, overdriven tone a-la Stevie Ray Vaughan. If you’re looking for even more crunch and crackle go with the Boss DS-1 or the Boss MT-2 Metal Zone for some face melting guitar work. As with all things, if you choose to go the boutique route there are many more options available to find the right sound for you, but there’s just too many to list here, so you’ll have to hunt for yourself.